There is only one slight draw back to this campground and that is that it is close to I94 so at sights in the front of the park you hear some road noise but it is not overbearing in fact I'll bet during peak season it's hardly noticeable we were able to tune it out after a bit I've stayed at some campgrounds where the onramp to the highway was right along the campground so this was nothing just something to think about if you don't like the noise pick a sight further back. we came to stay the 3rd week in oct. for fall color viewing along the Mississippi river and were not disappointed. We expected to be dry camping as they were going to plan to have the water turned off by then but when we arrived they still had the water on for the weekend and no extra charge for it. the sights are huge and level with a concrete patio and picnic table a large fire ring. My pull through site had full hookups water, sewer, electric and cable if you need tv while camping. The wifi works good but again I was very near the office but looks as if they have a good network of range extenders in play. the facilities were clean and adequate showers were nice and they were 4minutes for 25 cents. Most of the other amenities were closed for the season at this time of year so I can not comment on the pool or the lodge that is there. I'll go back again there are several place to go for food if your looking for a Friday night fish fry that are only a small drive away. Lovely family campground in the perfect location for us. Great amenities including a swimming pool. As we were just passing through ,We stayed only one night in a pull through site that was plenty long for our big rig. We experienced torrential rain during our entire stay. Thankfully, the campground had no standing water the next morning. The only ding I would give this place is that the campground charges for using the showers - 25 cents for four minutes. As full-time RV’ers, we have rarely seen this. Most often pay showers are found in remote, out of the way campgrounds, not in an RV resort place. My wife and I camped for years with our kids while they were growing up. We haven't camped in a long time, but bought a new travel trailer this year and wanted to take our three granddaughters with us to start some of the great experiences and memories that we made with our kids. Upon two recommendations from friends, we booked a five day stay at Stoney Creek. What a fantastic place!! All the amenities are designed for kids and the girls had a wonderful time. We had rain off and on every day we were there, but still found plenty of time to have fun. The pool/splash pad area is excellent, along with the mini-golf, bouncing pillow, and playground - they had a blast! The facilities were well kept, the bathroom/shower houses were always clean and inviting, and the Moose Lodge was fun. The staff was super friendly and helpful. We will definitely be back next year and will let other people know what a great place Stoney Creek is to camp and have fun!!! We took our granddaughters, ages 4 1/2 and 2 1/2, camping at this park two years in a row now and we all love it. We originally picked it because it was close to home just in case Grammie and Grampa had problems!! We spent most of the time in the pool because the girls loved the water. The frog slide was their favorite although we were in the big pool a lot also. Everything in the park was neat and clean and they had activities planned every afternoon for all kids. I would highly recommend this park. Top notch campground. Sites are very large. Plenty of room to stretch out and not feel like you're on top of others. Tons for the family to do including adults. Everything is very clean and the employees are great. This campground is a must. We're already planning a trip later in the fall and next year! We love Stoney Creek!!! We look forward to staying every year!!! There is so much for kids to do. My kids have a blast each time. If I had to pick a con.... the pool is a little on the small side, but all the activies makes you not realize with the exception of really HOT days and most people congregate there to cool off. There are SOOO many Pros to this place!!!! We love it here! We have traveled across the country and stayed in a lot of RV parks this is one of the nicest we've been to. Well organized, clean, good facilities, kid friendly, easily accessible sites with good spacing between sites. We were very pleased. Called ahead. Asked if campground was quiet. They said weekend but not very noisy. Failed to mention they were having Halloween weekend starting that night. Very very loud, RV site on a hill, not easy to back in. 4 people at check in, but had zero time to check us in. Would not trust info if calling them. Try another park. We were here on Monday through Wednesday, so we did not see or partake of the family activities. For our time, we loved the facilities and grounds. Close to all we wanted to see and do in the area, we liked this RV park and would definitely return. We would not come back on a weekend, however this is a campground that would be great for certain type of camper. The culture here is kids do what they want as do dogs. Everyone's kids run around through all the sites, even at 10pm we got startled stepping off of our steps as a kid on a bike whizzed past us in the dark almost knocking us over. Dogs run loose off leash. 99% of the RV's are small and you can tell these are just families camping here on the weekends who live close by. Everyone sits outside, campfires, noise, beer, that type of atmosphere. It's fine until you are ready to go to sleep and cant until the noise dies down. No open windows as the smoke is thick in the air. The owner even told us that he does not want this to be the type of park that attracts big motorhomes, but a kid friendly, weekender type of client. This is fine, his choice, but does not make for a pleasant time for those like ourselves who are travelers and want just a little bit of peace. Don't put a leash rule on your website when you don't enforce it and be very clear that this isn't a quiet park it is a weekend party park and kids and dogs may be let loose. The park is beautiful, large sites, a small lake, just a very beautiful park. It was empty during the weekdays of the week we were here, but the weekends are terrible & crowded. If you are ok with this type of environment then this would be an amazing place to go! Feeling a bit trapped here this Friday night and we can't go outside easily to potty our dog since our dog doesn't do well when charged. We will be losing the $47 we had paid for Sat night and leaving first thing tomorrow morning to get out of here ASAP. We have a 44' 5th wheel. It would be a perfect campground if you were just looking to be loud and have fun outside ...as it is certainly beautiful and well kept! Just not for us, not on a weekend night! Sure wish campgrounds were honest with what type of park they run and their true rules/policies so that people don't waste their money thinking they are getting one then when its entirely different. Just be honest guys! It's fine to run your park how you want, but let us know how that is upfront! Large site. Too many people allowed on a site made park extremely crowded on weekend. Several camping units, cars and families on a site. Very unpleasant experience. This is one of the best parks we've stayed in. Huge sites, both back in and pull through. Good utilities. Roads easy to navigate. Lots of room to walk, Plenty of activities for kids. Great owners. Large concrete patios. Some shaded sites and some open. Large separate section for seasonals with private entrance and exit - and all sites are neat. This is one of the best campgrounds we have ever seen. The common areas are well manicured, clean, neat. Has a large, well equipped pool area. It has numerous recreation areas that are easy to get to & well kept. Would be especially good for teens. Has attractive walking trails and a park-like admosphere. Easy to get to off the interstate but far enough to not be noisy. Not sure why it isn't a 10-10-10 except that the parking sites are not paved. We were only overnighting but if ever in that area again would stay longer. 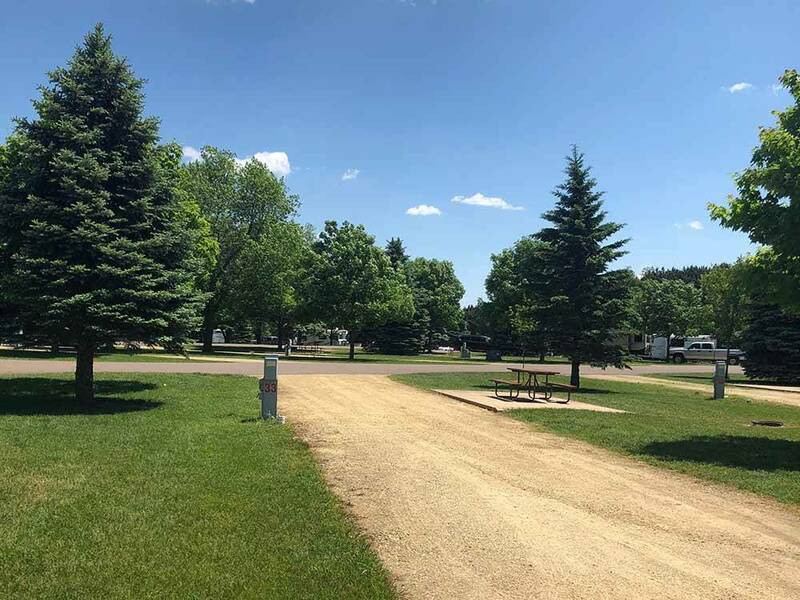 This is probably the largest and nicest RV Park in Wisconsin!! There is so much space between RV sites and camp sites it's incredible!! Nice paved roads for walking. Plenty to do and a lot of planned activities. Staff is there to help and very friendly. Make this a stop on your way north. Very nice park tucked away next to a small town. Large somewhat level lots. Full hookups, with double drains on the pull through sites. The park was tore down in 2000, and they have been rebuilding since. Pool, Volleyball, basketball court, skate park, horseshoe pits, put-put golf, a bounce pad, and newer showers/bathhouses. Cons - Wifi doesn't allow you to hook up streaming devices (Roku, Apple TV, etc.